Former dEVo rider and Spring Series organizer Austin MacDougall was killed in Edson, Alberta, while riding a week and a half ago. MacDougall was an RCMP officer and was 30 years old. Justin Lyle Jensen, 35, of Yellowhead County has been charged with impaired driving causing death and refusing to comply with the demand of a peace officer [see report Here]. Marsh Cooper (former dEVo, Symmetrics, Kelly Benefits) and Gordon Ross have organized a memorial ride in Ft Langley to remember Austin, at 10:30 am, on Saturday, July 22nd. The ride will begin at the Fort Langley National Historic Site (23433 Mavis Ave, Fort Langley). 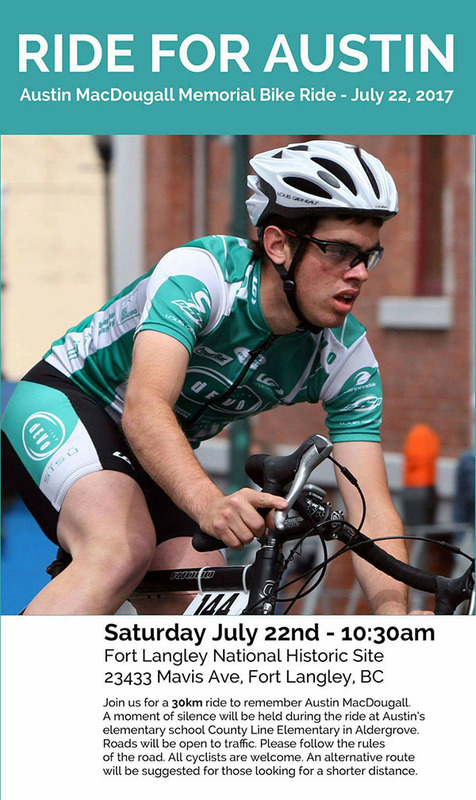 Join fellow cyclists for a 30 kilometre ride to remember Austin MacDougall. A moment of silence will be held during the ride at Austin's elementary school in Aldergrove, County Line Elementary. All cyclists are welcome.